Do you have a relative that is hitting a milestone birthday? 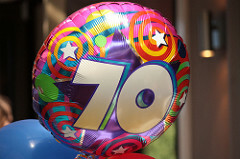 It is common for families to gather to celebrate the birthday of a loved one who is turning 70, 80, or 90 years old. It is possible to combine that birthday celebration with a family reunion. The focus of the celebration should be the person who is having a birthday. Get a huge birthday cake, or get more than one cake, so everyone can have a piece of it. Schedule a specific time to have everyone gather to sing happy birthday. Now that everyone has gathered in one place, it is time to take a family photo. Put the person who is celebrating a birthday front and center. Take the photo before you pass out the cake (so the kids won’t be covered in frosting for the photo). Have parents “count heads” and make sure all their kids are present for the photo. Who will take the photo? It might be a good idea to hire a professional photographer. This prevents the problem of having a family member absent from the photo because he or she was behind the camera. You are going to want this once-in-a-lifetime photo to be good – and a professional photographer has the skills to make that happen. Take your family tree to a business that can turn it into a poster or banner. Make it large enough for several family members to view it at the same time. Display it at the birthday party/ family reunion event. Your relatives will probably want to find themselves on that tree. This can lead to discussions about wedding dates, birthdates, and the sharing of fun family stories. One way to get younger relatives involved in genealogy is to make it fun. Put together a small table that has paper and pens on it. Make a sign to explain the directions. You can word it any way you want, but the main idea is to get people to discover exactly how they are related to three other people who are at the event. Challenge teenagers and adults to find out how they are related to three people whom they do not live in the same home with. Relatives must bring finished results to you – so they can collect a prize. Buy some colorful plastic bead necklaces from a party store as the prize. People will wear the necklace and other relatives will ask how to get one.